Compact, swift, stable, precise, low power consumption and high degree of automation are attributes well suited to describe the SB-40-TS. The standard 40mm extruder screw makes it ideal for the production of containers ranging from 5ml to 100ml. 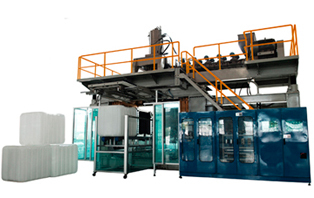 This model has been used to produce containers in the medical, cosmetic, body care and office stationary industries for more than three decades. The extrusion system of this model can be configured in multiple heads and is capable of processing a wide range of materials such as HDPE, PP, PA, EVOH, EVA, Surlyn, PVC, PET-G, PS, PCT-G, ABS and their derivatives. Final products and excess material can be collected manually or automatically via conveyors. maintenance such criteria can only be materialized with a perfect mixture of innovative design, imported components of the highest quality, materials of the purest blend, experienced craftsmanship and a rigorous quality assurance process of the highest standards. AKEI is globally recognized and accepted as one of the leading brands in the Extrusion Blow Molding (EBM) industry. 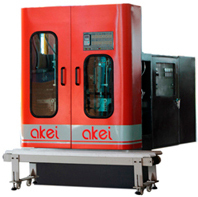 While the performance of the Linear Series machines is comparable to its counterparts in those well-developed countries the clear advantage can be found in ROI due to the fact AKEI's machines are reasonably priced. Due to this reason alone AKEI continues to be regarded as “top choice” for EBM projects by multinational companies around the globe. The highlights of this model are a horizontal transfer stroke of 900mm and a superior clamping force of 32 tons (160 BAR). Like all other models it is also possible to upgrade to multi-layer configuration as it is commonly requested from multinational companies of the Motor Oil Industry for the production of 5L jerry cans. Alternatively those multinational companies which cater to the body care and household market prefer this model in order to maximize production output of their products ranging from 300ml to 500ml. The Industrial Series was created due to the growing demand for larger plastic containers and products of complex design. To date, Akei has developed models in this Series capable of handling containers of up to 1200L in volume, 41kg in weight or almost 2 square meters in size. Keeping with tradition, the characteristics featured on each of these models are parallel to other Akei machine Series. Reliability and performance are enhanced by high-quality, imported components. Available only in single station configuration and accumulator design extrusion head. 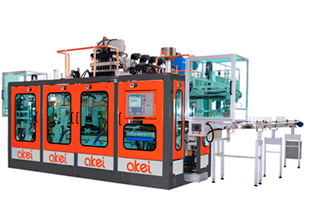 Presently, it is the biggest EBM machine manufactured by AKEI. This model was developed specifically to produce Intermediate Bulk Containers (IBC) of up to 1200L in volume. With the ability to plunge 41kg in a single shot, an impressive clamp force of 200 tons (160bar) and a mold platen area just under 2 square meters, this model is also able to produce heavy duty pallets for transporting and storing industrial goods at 4 tons dynamic load and 5 tons static load respectively.